Accueil de l'OCDE Gouvernement d'entrepriseConference on improving women's access to leadership: What works? Conference on improving women's access to leadership: What works? 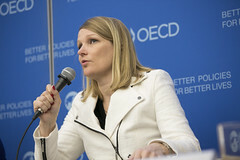 On 8 March 2016, International Women's Day, the OECD hosted a conference to consider policy approaches to closing leadership gender gaps in the public and corporate sectors. Moving beyond the quota debate, the event fostered a policy dialogue on existing barriers and missing opportunities for women in decision-making positions, and their impact on broader social and economic outcomes. The discussions were underpinned by a background report on new trends, international benchmarks and good practice. OECD Secretary-General Angel Gurría welcomed senior decision-makers from the public and corporate worlds, experts, academics, and other stakeholders to this event.